Was your ancestor an inmate, guardian, staff or supplier for the Ennistymon or Kilrush Union workhouses in County Clare in the west of Ireland? The Irish workhouses were institutions created in 1838, to provide a place of relief for the poor, sick, elderly and orphaned across Ireland; however, they were used as a final measure. They were designed to be cold, intimidating and uninviting. As poverty, starvation and disease spread across the country from 1846 onwards, the workhouses became overcrowded and desperate. The Board of Guardians were responsible for the management of the workhouses. They met on a weekly basis and recorded the discussion of their meetings in these minute books. Place – any place in relation to the individual; a residence, birth place, etc. The records include the Board of Guardians minute books from the Kilrush and Ennistymon unions, two of eight poor law unions located in County Clare. There are 286 pieces in total. The minute books recorded weekly reports of how many men and women were housed the amount of ‘lunatics’ or ‘idiots;’ how many were discharged or died, and the number of births. They also recorded the workhouse expenditures like food supplies or salaries and the number of inmates receiving medical treatments. The Board of Guardians were charged with the task of distributing relief to the completely destitute. They operated workhouses which were built to hold 600-800 inmates, but were overwhelmed with thousands coming to their doors seeking salvation from disease and starvation. Kilrush is a coastal town in County Clare. In July 1842, the Kilrush Union Workshouse admitted its first inmate. The Union included 13 electoral districts: Kilballyoan, Kildysert, Kilfidduan, Kilkee, Killard, Killiner, Killofin, Kilmacdooaun, Kilmihil, Kilmurry, Kilrush, Knock and Moyarta. Few places in Ireland suffered more from the misery of the famine than Kilrush union. Large numbers of people died, thousands were evicted and many more emigrated. In 1849, The Illustrated London News created a seven part series on the new Poor Law in Ireland. The series focused on the conditions of Kilrush. 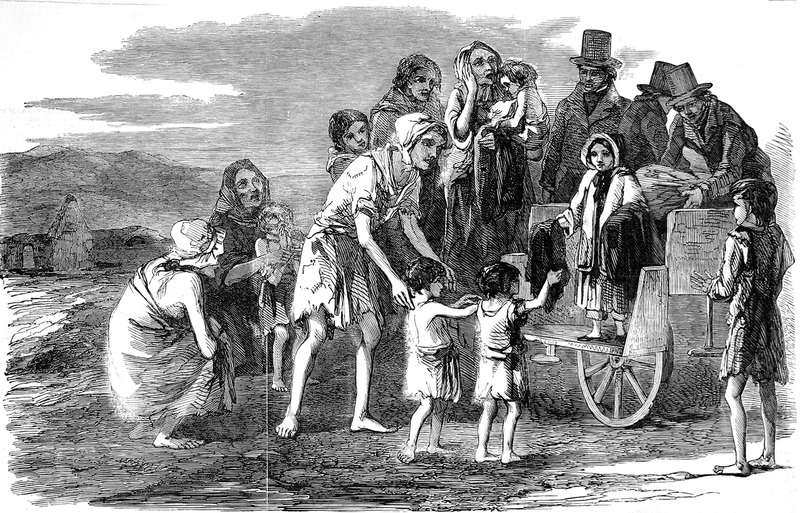 Many of the illustrations created are iconic representations of the famine in Ireland. One particular image is of Captain Kennedy’s daughter giving out food to the starving. Captain (later Sir) Arthur Edward Kennedy took over the position of Poor Law Inspector in Kilrush in 1847 for three years. During his time he made powerful enemies, especially of the landowner, Crofton Moore Vandeleur, who he challenged to a duel. From 1847, thousands were being evicted. They were left deprived and sought temporary shelter in bogs and ditches. Eventually, many made their way to the overcrowded workhouse, but hundreds died before they could reach it. In June 1849, the Dublin Evening Post reported that a letter from Captain Kennedy was read to the House of Commons regarding the evictions. He wrote that there have been 15,000 evictions in the last year and the homes of 20,000 were to be levelled. The House of Commons debated whether to interfere with the evictions, most of which were lawful. In 1850, the average number of deaths within the workhouse was 40 a week. The fever hospital was overcrowded and hundreds were receiving medical treatment. The workhouse of Ennistymon (sometimes spelt Ennistimon) Union, in North West Clare, was built to house 600 inmates and admitted its first inmate on 5 September 1845. By 1846, the workhouse was operating at full capacity. The admission books have not survived. The union encompassed 13 electoral divisions including: Burren, Carron, Corofin, Drumcreehy, Ennistymon, Kilfenora, Killilagh, Killonahan, Kilshanny, Liscanor, Miltown Malbay, Rath and Rathborney. During the years of the famine, the union lost almost 23 percent of its population. The causes of death included fever, dysentery, diarrhoea, dropsy, smallpox and measles. The death rates were so high that a parliamentary inquiry was called. In 1848, the board of guardians was dissolved because of their mismanagement of the workhouse and not providing adequate accommodation. Non-elected vice guardians took control of the site and conditions slowly improved. As disease spread in the county, medical officers continued to warn guardians against taking any inmates with illness. Most of the workhouses were not large enough to have sufficient infirmaries and the sick were spread throughout the buildings. In the mid-1840s a fever hospital was built. In 1852 parts of Ennistymon became part of the new Ballyvaughan and Corofin Unions.